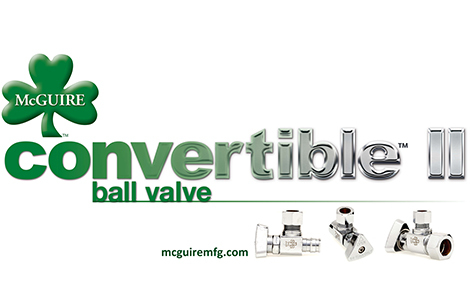 McGuire is proud to announce the new Convertible BVII series which completes our stop valve product line and delivers our most comprehensive stop valves available on the market today. Now engineered for both commercial and multi-use markets, McGuire’s unique quarter-turn ball valve converts to a loose key application for vandal proof installation. McGuire offers four lines of commercial grade stop valves, all designed, engineered and manufactured for years of continuous, commercial use. The compression nuts are precision machined from high-copper content brass bar stock. The thickness of the sides and top of the nuts are specially designed to virtually eliminate cracking during installation (requires professional commercial installation and maintenance.) Equally important are the peroxide cured ethylene propylene dien monomer (EPDM) washers often referred to as the “purple washers” that will not degrade when exposed to chlorine, chloramines and high-water temperatures. Both of McGuire’s Classic and BVII series deliver a true-brass machined ball valve with a unique convertible handle providing both loose key or wheel handle. The BVII series is engineered specifically for commercial multi-use residential projects with the performance of Classic Convertible™.